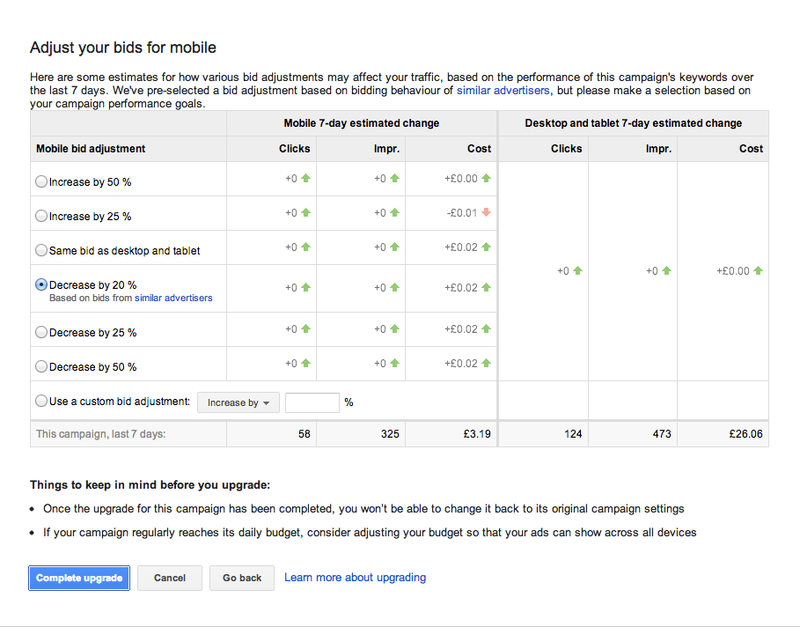 In our last blog, about the new enhanced campaigns in Google AdWords, we told you not to panic if you see the option to upgrade early, and advised to wait until there’s more information. 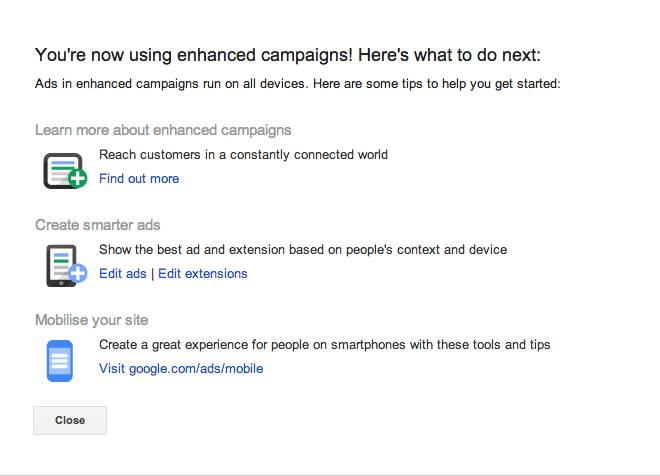 If you don’t know what enhanced campaigns are, take a look at our initial blog on this subject. To find out what happens if you do click on the dreaded ‘Get Started’ button we took the plunge so if you’re not quite ready you don’t have to. Clicking ‘Do it later’ closes the pop-up and makes no changes. Perfect if you get cold feet! Clicking on ‘Learn more‘ takes you to a help screen within AdWords, and, of course, ‘Start now’ moves you on to the next step, which is adjusting your bids for mobile. ‘Decrease by 20%’ is selected by default in this case. We chose the option to keep the mobile bids the same as desktop and tablet so that the campaign’s performance would remain unchanged (even though we chose to upgrade a paused campaign). 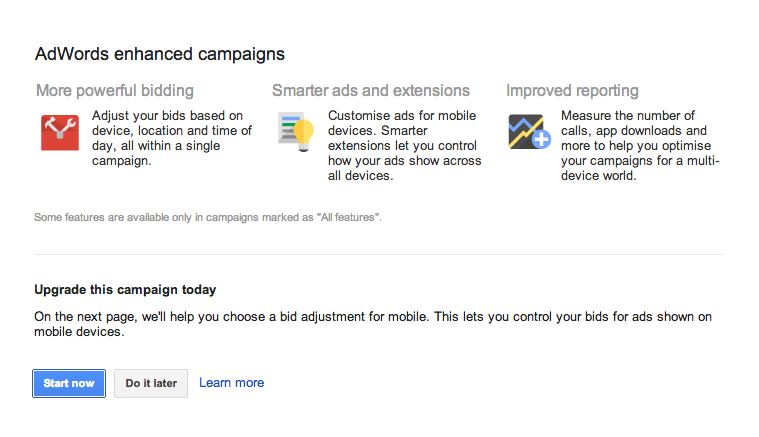 This option to alter your bids depending on device is the main change that comes with enhanced campaigns. All through this short process you’re given the option to learn more or back out, which is always handy! Clicking on ‘Find out more‘ takes you to a page where you can learn more about mobile advertising campaigns. After clicking ‘Close’, the updated view of the account shows which of the accounts have been upgraded. The ‘Enhanced’ column will read either ‘Legacy’ (i.e. not upgraded) or ‘Enhanced’. Once you’re in the upgraded campaign there are a few changes that we’ve noticed. – ‘All Settings’ is what you land on by default. The options here are the same as what would normally appear under the ‘Settings’ parent tab. Under the ‘Locations‘ tab, you get a breakdown of the account’s performance by country/location. 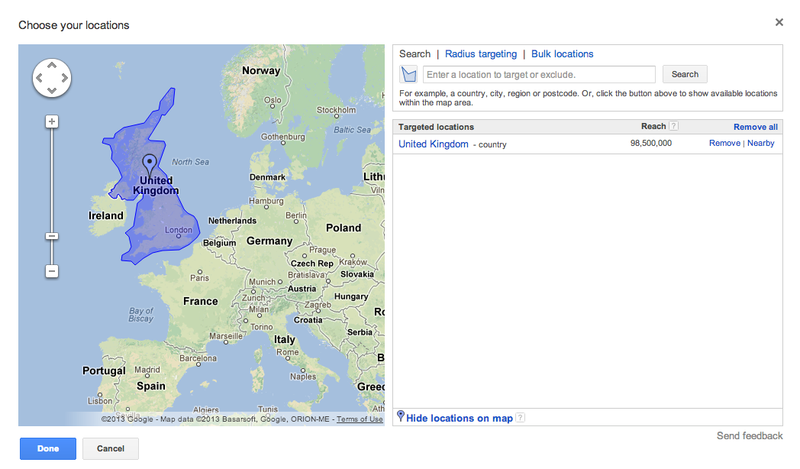 It’s here that you can choose the locations that you wish to target. You can enter a new location by typing in the text field. The ‘Ad schedule‘ section is where you can set up a schedule for your ads, in case you don’t want them to appear at certain times throughout the day. ‘Create custom schedule’ expands the options for you to choose which days to appear on, including a start and finish time for each. ‘Mobile devices with full browsers’ is the only item in this list that can be changed. It’s possible to bid up or down a percentage of your standard bid when appearing on a device in this category. So that covers pretty much everything that we could find that looks different from the standard, non-upgraded campaign. Upgrading is really quite straightforward and can be done in as little as four clicks. As we learn more we’ll continue to update you with our findings. 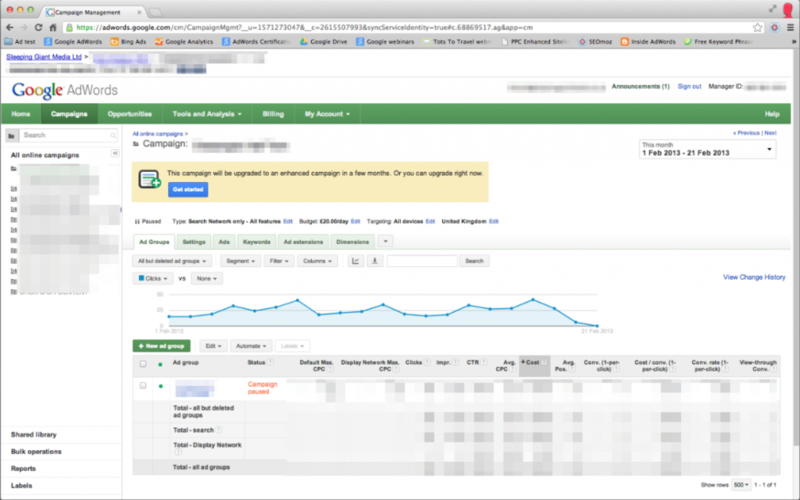 Have you any experience with enhanced campaigns? We’d love to hear how it’s going for you.